For everyone on the lower end of the spectrum, there is still home buying hope. 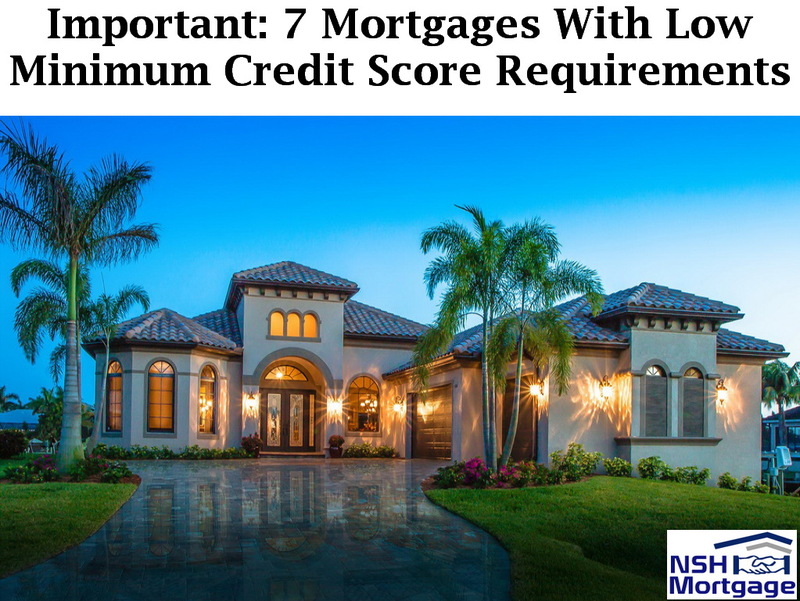 Here are seven mortgages with low minimum credit score requirements. NSH Mortgage has the knowledge and tools to help you find the which mortgage works best for you. For instance, FICO credit scores range between 300 and 850. According to Ellie Mae, the average FICO score for approved FHA mortgage applications were 689 basis points. In addition, some were much higher at 755 basis points for conventional applications. Government and non-government loans have come with their own minimum credit score requirements. Know the most lenient programs to increase your chances of approval. Some mortgages are specifically designed to help lower credit applicants get into homes. From a lender’s perspective, credit scores fall into several categories. Borrowers with fair credit can typically get approved, but those with poor credit will have a harder go. No matter what your credit, though, check all available loan options. You may be closer to qualifying than you think. An appealing quality of a FHA loan is that, unlike conventional loans, FHA backed loans do not carry risk based pricing. This is also known as loan level pricing adjustments (LLPA). Risk based pricing is a fee assessed to applications with lower credit scores or other less than ideal traits. There may be some interest rates that aim for lower credit scores but even so, they tend to be significantly less than for conventional loans. For homeowners, this means lower credit scores do not necessarily always come with higher interest rates. Although FHA requires a minimum 500 credit score, most lenders will not go that low. Furthermore, any score below 580 requires ten percent down. Many lenders require homeowners to have a minimum FICO score of 580 to qualify. While, some other lenders are imposing a higher minimum, such as 620 or 640. VA loans are noteworthy mortgage loans presented to veterans. In fact, these loans do not require a down payment, nor any mortgage insurance. Unlike FHA, the VA does not impose a minimum credit score requirement. However, most lenders will want to see a minimum credit score between 580-620 before approving a VA loan. Similar to FHA loans, though, VA loans do not have risk based pricing adjustments. Applicants with low scores can get rates similar to those for high credit borrowers. Many homeowners are drawn to this third type of government loan thanks to its zero down payment requirement. Most lenders request that you have at least a 640 FICO score to qualify for a USDA loan, although some will drop it down to 580. As with FHA and VA loans, however, USDA homeowners with a 580 credit score will be more carefully evaluated than those with a higher credit score. Non-government conventional mortgage loans require higher rates and fees for low credit scores. Fannie Mae and Freddie Mac, the agencies that administer most of the conventional loans in the US, charge loan level price adjustments, or LLPAs. As LTV rises and credit score falls, the fee goes up. For instance, a borrower with 20% down and a 700 credit score will pay 1.25% of the loan amount in LLPAs. An applicant with a 640 score and ten percent down will be charged a fee of 2.75%. Most lenders will require homeowners to have a minimum credit score of 620 to qualify for a conventional loan. While conventional loans are available to lower credit applicants, the fees could make FHA much cheaper. Released in March 2015, Freddie Mac’s first-time home buyer program, Home Possible®, is helping buyers get into homes at a very low down payment. Home Possible® is available for low and moderate income borrowers. As well, it allows for a down payment of just three percent. To qualify for the Home Possible® loan with reduced PMI rates, most lenders will require a 620 or better credit score. Released in December 2015, HomeReady™ is a great Fannie Mae loan program for low to moderate income borrowers, with expanded eligibility for financing homes in low income communities. Unlike Freddie’s Home Possible® program, you do not have to be a first-time home buyer to qualify for HomeReady™. Besides the low down payment option of just three percent, one of the most appealing traits of the HomeReady™ program is that it allows non-borrower household member’s income, regardless of their credit scores. Most lenders require a minimum of 620 to qualify for HomeReady™. The qualified mortgage rule, also known as the QM Rule, went into effect in 2014. The rules associated with QM were set forth by the federal government, and were meant to create safer loans by prohibiting or limiting certain high risk mortgage products. Not all mortgage lenders have to follow the QM rule. When lenders do not sell their loans to investors, they can, for the most part, make up their own rules. Credit score requirements for non-QM programs can vary, but many lenders offering non-QM loan products will go down to credit scores as low as 500.